The refurbishment and extension of Logen Teater marks a new chapter in the life of the centenary institution as it welcomes its new tenant, Hordaland Teater. Phase 1 of the project, completed in October 2017, is comprised of the refurbishment of the lobby and reception areas of the theatre, as well as a new bar creating a transition between the old and the forthcoming extension, providing the first glimpse into the combination of both institutions together. The bar is designed following an existing structural grid, using new materials and lighting and featuring an iconic curtain-shaped bar. Phase 2 of the project, currently ongoing, includes a new extension with supporting programme for the theatre company. Hordaland Teater (HoT) is a Norwegian regional theatre established in 1988. 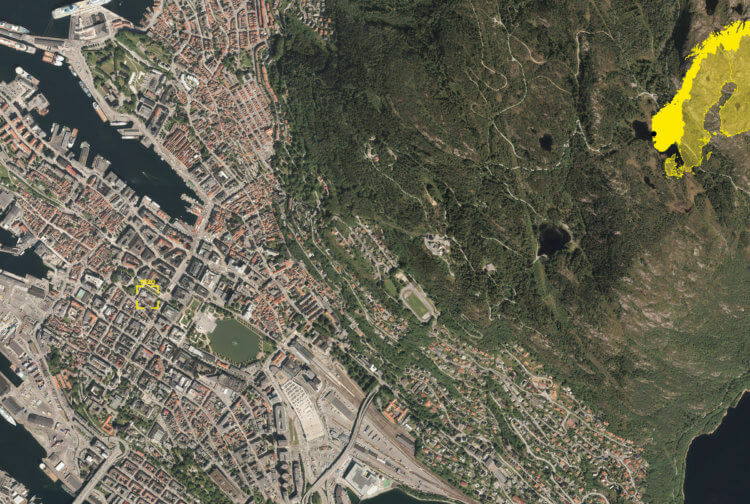 Recently the cultural institution decided to move to city centre of Bergen into a new stable location, Logen Teater, providing it with greater visibility, access to a new audience and an attractive workplace for its employees. 3RW arkitekter and Fortunen arkitekter are in charge of the refurbishment and extension of the premises to accommodate Logen Teater’s new tenant. Logen Teater was built in 1883 as an events and entertainment venue, becoming an important part of Bergen’s popular culture ever since hosting concerts by Edvard Grieg and its annual 17th of May celebration. The combination of these two important cultural institutions, Logen Teater and Hordalant Teater, is a unique opportunity to strength the historical importance of the past and bring new energy into the new Logen and HoT that will be visible in the centre of the city. The project has at its core the existing building, while the new building is understood as an extension. The existing promenade from the entrance to the main stage is reinforced, and the access to the new extension becomes integrated into the current flow. New elements are added to the existing building: two new bars, new wardrobe walls, and a new lift aimed at improving the public experience. On the other hand, the new building will facilitate the institution’s logistics: a new fright elevator, rehearsal rooms, and workshop spaces for woodwork, masks and costumes. The new design for Logen Teater and its new tenant, Hordaland Teater, opens up the cultural institution to Bergen and the region, giving it a new civic presence.